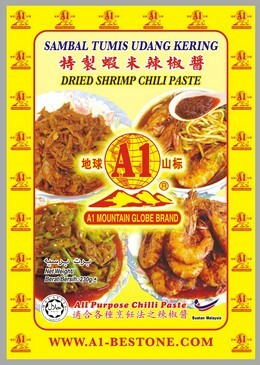 ½ pack A1 Brand Dried Shrimp Chili Paste, 1kg Yellow noodles, 300gm Bean sprouts, 100gm Chicken breast meat (sliced), 8pcs Medium prawn, 1 tablespoon of garlic minced, 1 Onion (sliced), 1 tablespoon of Soya sauce, 1 tablespoon of Oyster sauce, ½ tea spoon of sugar, 500ml of water. 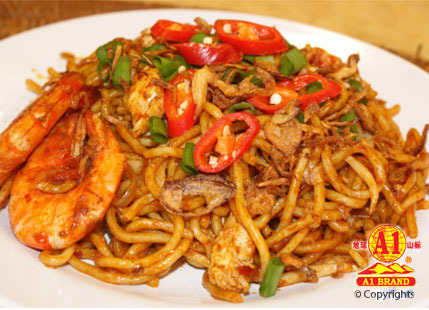 2) Add in chicken and medium prawn stir-frying till half cooked. 5) Add in yellow noodles, fried with high heat then add in bean sprouts fried thoroughly. 6) Lastly topping with spring onions, red chilies and fried shallots (shallot chips).